PORT-AU-PRINCE - Soccer-mad Haitians are revving up to watch the World Cup on large-screen televisions at makeshift camps, their first collective therapy since the devastating January earthquake that killed up to 300,000 people and left more than 1 million homeless. In the crowded camps in the Haitian capital and other quake-stricken areas, people are preparing to watch the World Cup even though Haiti did not qualify for the month-long event that began on Friday in South Africa. "I lost everything I had in the disaster and I can't help thinking about how miserable my life has become," 36-year-old Jean-Marie Sannon told Reuters on Thursday. Sannon stood under a makeshift tent in an overcrowded camp in the Champ de Mars area near what remained of the presidential palace that collapsed in the magnitude 7 earthquake on January 12. "I probably would have become crazy if the World Cup were not organized this time around," Sannon said. "But if Brazil win, I'll spend the rest of the year celebrating even without a dollar." The government and several national and foreign sponsors have set up giant screens in popular areas, around tent cities and elsewhere to help residents watch the games. "During the World Cup I will probably continue to go hungry and continue to face all the problems I have been facing, but I don't think I'll have time to think about that," said 27-year-old Norluck Moreau. "I'll be watching the games," said Moreau, listening to a sports broadcast from a small radio. "The World Cup is the greatest therapy I could ever have and I will enjoy it to the fullest." The Minister of Culture and Communication, Marie Laurence Jocelyn Lassegue, said at least 137 municipalities had received two large-screen television sets and one generator each, to make sure soccer fans can watch the competition. "We have made sure television stations around the country received the satellite signal so that they can screen the matches live," she said. "It is a good thing that they can watch this together and have some fun." The director general for the National Telecommunications Council, Marcelin Montaigne, said the government has provided funds to the state-run national television station to help it establish relay stations throughout the country to make the games available to as many people as possible. The communication director for the UN peacekeeping mission, David Wimhurst, said two giant screens have been set up in the capital's stadium to allow about 10,000 people to watch the games every day. "People will have to pay 10 Haitian gourds (about 25 US cents) to watch the games. They pay this small fee just to help control the crowds," Wimhurst said. 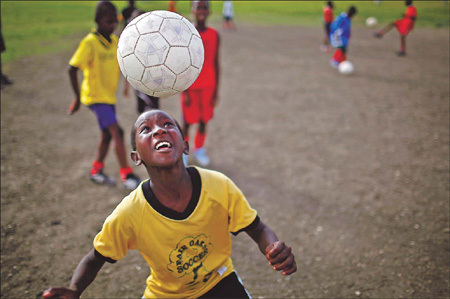 The money will be given to the Haitian soccer federation to help families of players killed in the earthquake. Haiti's only participation in a World Cup was in 1974 in Munich and the Haitian national team was eliminated in the first round. Brazil, Argentina, Italy, France, Germany and Holland are respectively the foreign sides with the most fans in Haiti. There has been a growing support for the South African side and other African teams, particularly when playing against other sides that are not on the Haitian's favorite list. "My team is Argentina, Messi is the world's best player and Maradona was a phenomenon as a player and he will surprise as a coach. So watch out!" said 40-year-old Joanne Lucien.